While reading The Book of Zohar we must remember that it is only about the connection between us. It all depends on the relationship between the friends, and in this relationship spirituality is revealed. The forms of the connection between us depict the picture of reality, since now too you see these forms of connection. In any case, you perceive the world according to your Reshimot (reminiscences), and this is where the picture of the world that you imagine stems from. There is no world outside you; there is only what you imagine inside you. Now you are among people in this world; you were born and developed in our time, but your worldview is also built by your being connected with the whole world. A boy left in the woods who has never seen human beings perceives the world according to the Reshimot in the form of a forest, animals, and other forms of nature since he doesn’t perceive his environment on the human level, but on lower levels, still, vegetative, animate nature. You, however, perceive reality also on the level of speaking. But in the relations between all these parts of nature: the still, vegetative, animate, and speaking nature, you discover your reality. So if we want to reach more advanced forms of perception, we have to evoke more advanced forms of connection between us. No wonder that this is what the wisdom of Kabbalah requires: You should develop more advanced and complex connection with others and in them you will discover a higher reality, which is more advanced and more internal. Everything depends only on the levels of the connection. Now comes the time when all the connections between us are destroyed and we actually see that, and the world obligates us to form new connections. The world doesn’t know yet what types of connection they should be. As we have already heard about it, we have to start fulfilling them. This is what awaits us. This is what the wisdom of Kabbalah talks about: Leave all your imaginary dealings and start dealing with building the correct future society. Then according to the connection between you, which you want to establish, you will receive help from above, from nature’s forces. The integral nature that is being revealed now will help you, it will influence you, and you will feel to what extent you are adapted to its general advancement, and you will succeed. We can say that nature is the Creator, but it doesn’t matter since it is about laws. So where can you change anything in order to hasten your development? Now for the first time in history you can hasten the development of humanity. Before you were always dependent on forces that moved you forward. Internally new connections between people were revealed and new social structures appeared: instead of the tribe, there came along the era of slavery, and then the Middle Ages, then capitalism, and now we are advancing towards communism. These are the five social structures. But what has advanced humanity? It was all about the changes in social structure, the new connection that appeared between people. But now, during the fifth and last era of our development, you cannot discover new connection naturally. You will discover them in a negative way, since you have to complete them. Here everything depends on your conscious advancement. You have to attain it, you have to adapt yourself to nature—this is the process we are in. So we are actually creating a new social structure, hastening the process that all of humanity will have to go through. This is called being a “kingdom of priests” and a “holy nation,” setting an example and being the conductor. But we are building this in the group, between us, and it is all in the new connection. Question: Why do I discover new things about the world when I correct my attitude to others and love them? Answer: It is always about your desire. There are only the vessel and the Light—the desire and what happens in it. The whole point is how I treat you, the “outsider,” from within my desire. In other words, there is an image of a stranger in me, and I have to correct my desire with respect to that image, to turn my desire around, and accordingly, to discover a new state. I never exit myself. I only need to change myself, my bad attitude, my hatred, and turn it to love. Then I will discover the spiritual world in my relationship with you. But where does the image in me come from? It is a result of the Creator’s action. Every level in nature—the still, vegetative, animate, and speaking—all the levels of the development of the desire from the “root” phase until “phase four,” lead me to the Creator, to attaining the upper force. This means that everything that I feel on the outside is the Creator. Therefore Rabash says that we should see the Creator in the friend, or at least behind a friend. So the external image in my perception is the spark, the particle of Light, the Creator. Thus, thanks to the shattering of the vessels, I suddenly discover the others, the strangers outside myself. A “dipole” is revealed in me: I and someone else. This someone fills the place of the Creator for the time being, so that I can exercise self-improvement with him; but in fact, there is nothing but a person and the Creator. So we should understand that in our corrections in the circle of friends, we help improve the whole world. Here we can understand what Baal HaSulam says at the end of the “Introduction to The Book of Zohar“: If Israel correct themselves, the Light pours from them to the rest of reality; we don’t need anything else. It is enough for us to correct ourselves. So my friend is not a friend but the Creator, who has inserted this image into me on the background of all the other levels of reality. On the fourth phase of the development, the created being feels shame before the Creator, and it is exactly for this reason that I hate the friend that I see before me. This is the result of that shame. Let’s go back to what a person learns during the correction. Without this information it is simply impossible to manage. Since how can he increase his love? Every level is made of feelings and mind—it is impossible to advance only by one of them. After all, the pleasure is only in attaining the Creator’s actions. He wants us to discover Him as good and benevolent. In order to do that, you have to know how He does it: by what wisdom, in what way, with what concern. The wisdom is essential here, and it has to be deep wisdom, as if you are dressed in the Creator. In our world you will not understand parents until you actually grow up and become a father. It is the same in spirituality, the adhesion is necessary, since without it you will not understand the Creator: who He is and what He is. Love comes as a result of this. Unless you attain the Creator, you will not be able to love Him. As adults, we remember different events from our childhood, what our parents did, what they taught us, how they sacrificed themselves for us, and we begin to understand them, and to love them much more than in our childhood. It is the same with the Creator. Question: How can I correct my perception if I only see evil in the world around me? Answer: Only the Light that Reforms corrects everything. We, on the other hand, are required to continue persistently, since despite all the explanations and the efforts that we make in our heart and mind, we will not understand anything until we reach the first revelation. Then a new mind and feelings open up for us. Today, no matter how much we want to perceive the explanations, we are wasting great efforts by trying to perceive new spiritual discernments in our current vessels. We constantly yearn for that, but in fact, our work should be totally different. It is as if we are stuck in one place just burning our fuel, our attention and time. It is because such efforts don’t help us attain the spiritual world. It is as if we are trying to push a ball through a square opening, but it doesn’t work; it’s a completely different system of measurement. The more efforts we make in bestowal and connection, and the less we try to get spiritual information in our current corporeal perception, the more we will succeed. No matter what, by using our current mind and feelings, we will never understand what the books say or the states that we are going through now. We are like a child who is trying at the age of three to understand his own psychology. Of course he cannot even understand himself, and certainly not the mature and more advanced thinking. It is simply impossible. I am telling you about this since I also used to make the same mistake in the past. For a long time I couldn’t be convinced that the spiritual world is attained only by self-annulment, by self-submission, by devotion, and not by the rational mind, sensible understanding and feelings. It is important to remember that “it isn’t the wise who learns” and to keep the right attitude towards the study, the right attitude between what is essential for our advancement and what can interfere with it. Question: Could you please explain to us why you, as a Kabbalist, leading the whole world to unity, pay special attention to the Jews and Israel? Doesn’t Kabbalah, as the method of general correction, pertain to all nations? Answer: I can assure you that I come only from the need for universal integral correction of the world; I see the goal to unite everyone in one desire to reveal the Creator in us. Moreover, in this revelation the Creator is manifested precisely in the desires of the nations of the world. But the revelation itself occurs through those who were in it in their previous reincarnations, and these are today’s Jews, although they do not suspect this. To correct the world, they need to be brought, to the extent possible, to study Kabbalah. Who leads them to it is everyone in whom the point in the heart is awakened, both Jews and non-Jews, all the members of the world Bnei Baruch Kabbalah group. Their studies attract Ohr Makif, the Light that corrects egoism, to them and through them as Jews to the entirety of humanity through the internal network of connection of all created beings in a unified integral system. That is why the nations of the world subconsciously feel that the Jews have a secret (conspiracy), and that they are the cause of suffering in the world. Thus, it’s necessary to call the Jews, carrying the genes of the spiritual world (Reshimot) from the time when they were in its revelation to the fall from that level 2000 years ago, to fulfill their duty to the Creator and humanity. See the explanation of Baal HaSulam in “The Introduction to The Book of Zohar,” p.60. Baal HaSulam, Letter 1: And since the supervisor and the supervised are one, it is impossible to distinguish between the evil and the good, and everyone is loved and everyone is clear, since everyone carries the Creator’s vessels, ready to praise the revelation and the uniqueness of the Creator, and this is felt by sense and according to this value, they eventually know that all the actions and the thoughts, both the good and the evil, carry the Creator’s vessels, and He prepared them and they came out of His mouth, and this will be revealed to everyone as the end of correction. But in the meantime, it is a long and threatening exile, and the main problem is that when a person sees some action that is not right, he falls from his level since he thinks that he performs this action, forgetting that He is the one who is the cause of everything and that everything comes from Him, and there is no one else who operated in the world besides Him. It is the same with regard to the present and the future: If a person considers something as bad, it means that he doesn’t attribute it to the Creator, but rather to other reasons. This is how it is arranged by the upper Providence. If he thinks that there are other reasons than the Creator, then he is actually guilty of what is happening, and it is called “and you shall worship other gods,” idolatry. Thus a person breaks the first law of “there is none else besides Him,” and therefore, gets off track. He is not focused on the goal of creation anymore, on the revelation of the Creator; he is not between balanced forces that bring him to the truth. Therefore, all our work is to reveal the upper Providence as the private Providence that comes from “there is none else besides Him” in the form of the good and the benevolent, at any moment in the past, present, and future, and it is the same for all the people in the world. A human being is the point from which a person determines that “there is none else besides Him” and that He is the good and benevolent. The point from which a person determines the quality of the upper Providence grows gradually until it reaches the dimensions of the Creator. This is where all the 125 degrees of our spiritual growth are. My Comment: Everything is controlled by the same program in which we are all included as a whole, complementing each other in order to bring all that exists to the same goal, when the whole mass, due to the conscious work of humans to unite with their own kind, adheres to the upper governance. Question: What are the differences and similarities between the concepts of “faith above reason” and “humbleness”? Answer: Faith above reason is bestowal, which “hangs” above egoism in spite of it. Humbleness is an agreement with the direction from above and the passage to faith above reason. It precedes faith above reason. Faith is called a property of bestowal. If we embark on the spiritual path, we must exert effort in order to make each next step. On the other hand, the greater part of mankind will obtain the spiritual world “in a single step” so to speak, and we are the ones who will provide this step: by our sweat and hard work. What do we get out of this? At best, satisfaction with the work done, or simply nothing. This is what it means to be a “kingdom of priests” and a “holy nation”: This is exactly what the Torah calls the ones who carry out this mission. In other words, everything we do, we do in bestowal, which is “holiness.” We work hard seven days a week; we face ungratefulness and resistance, and in the end, everyone, all at one time, will receive that which cost us so much, and it’s in them where the greatest Light will unfold. Question: But how? One percent gives all their soul to it, crosses the Machsom, reforms itself to bestow, and, all of a sudden, the rest of the 99 percent, in one easy move, collects the entire revenue? Answer: Our pleasure, above all, is to delight the Creator so that He won’t know about us. That’s what it means to really bestow without wanting a reward: I bring Him pleasure and He doesn’t know who His secret admirer is. He thinks it came from somebody else. Otherwise, if both of us, the Creator and I, know that the delight is coming from me, it’s a payment, and there is no greater payment than that. Question: Why did the Creator handpick us to bestow from the whole of mankind? Answer: There are souls who feel that they are supposed to become realized in the most advanced form as compared to the rest of mankind. Their progress is tied to the vital need to find the Creator, the mystery of life, the general system of all creation, the grid that links all in one. This idea, this desire, takes a hold of them and doesn’t let them go. Question: Why, then, do we receive troubles and problems on the spiritual path? Answer: You seek justice? There is such, but it is not what you think it is. Justice lies in my gratitude to the Creator for this hard work, for the chance to bring Him delight that I won’t even know about and that He won’t know comes from me. This is the true, pure bestowal. Question: However, the other 99% eventually will overtake us on this path! Answer: That’s true; and I thank the Creator for this special role He assigned to me. I have accomplished selflessly, and this is my reward. I reached a state where lack of payment is my pay, and this is what fulfills me, and it is called the Light of mercy, the Light of Hassadim. Question: What do we need to keep in mind so that the group doesn’t turn into a bunch of mockers? Answer: Each time, we deliberately fall under the influence of the Creator who taunts us and shakes us like babies so much He as if simply “shakes it all out” of us. Today we are so nice and “cute,” ready to love everyone and everything. But tomorrow we will once again be completely opposite. How can we forget that our path is made of ascents and descents? We can’t remember it if we forget about the Creator. Why is it said: “Israel, the Torah, and the Creator are one”? Israel means “yearning for the Creator.” Hence the remedy for correction: our studies, the group, where all of this gets realized, and the Creator Himself have to be as one, in one place. There are the Creator, the group, and me. We have to constantly link it all together into one unified whole; there can’t be any other view of the world! In order to focus and properly look at what is happening, I need these three points: the eye, the sight, and the target. Otherwise, I won’t be able to do anything. Therefore, if we wish to keep the group in the right intention, it is our responsibility to keep in mind that our goal is adhesion with the Creator. Otherwise, what is going to motivate us, our egoism? Today I am willing; tomorrow I am not. Here the Creator appears as the definer, the first to act, or the one who initiates our actions, who forms the group and everything that is happening to us, who gives us everything. All that we have in our hearts and mind right now, all that we hear and feel, all of it is His doing. How should we, together, respond to it, based on the fact that we felt something coming from Him? From this moment on, our work begins. This is exactly the moment when all of us clearly felt that it was He who brought us together right now; He connects us all in one desire, one intention, and the same thought. It is He who arranged everything for us, so that we all together started to ascend to and strive for Him. So how can we rise to Him so that we could consciously fortify among ourselves what He has created? 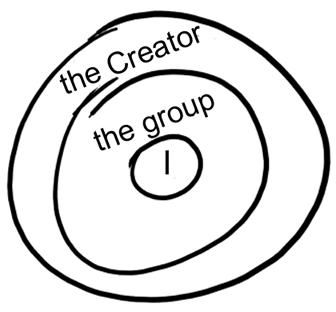 What does it mean: “I now link myself with the group?” I link myself along with the others and the Creator into the common desire, one common goal, and common aspiration. If the effort that each of us exerts links all the others and the Creator together, this is precisely our active response. This is how we must act. If we envision that everything derives from the Creator and know how we should respond to it, then it will be very effective work, a very effective move.